Since the discovery of streptomycin in 1944, aminoglycosides have endured as indispensable agents in the antimicrobial armamentarium. This is despite their well described potential for serious nephrotoxicity and otoxicity and the emergence of other classes of antibiotics with similar antibacterial spectrums. The major aminoglycoside antibiotics in clinical use worldwide include gentamicin, tobramycin, amikacin, netilmicin, neomycin, isepamicin and arbekacin. These agents remain in clinical use against gram negative infections largely because of their dependable efficacy. Several attributes render these antibiotics particularly effective. First, aminoglycosides exhibit a concentration-dependent bactericidal activity [1, 2]. Unlike the β-lactams, the bactericidal activity of aminoglycosides depends more on their concentration rather than the duration of antimicrobial exposure. Further, the bactericidal efficacy increases with increasing aminoglycoside concentration. Aminoglycosides also exhibit a post-antibiotic effect meaning they continue to kill bacteria even after the aminoglycoside concentration has fallen below the bacterial minimum inhibitory concentration. Another useful attribute of aminoglycosides is their synergism with antibiotics that inhibit bacterial cell wall biosynthesis, such as β-lactams and vancomycin. Finally, aminoglycosides have relatively predictable pharmacokinetic characteristics that allow them to be dosed to minimize their inherent toxicities. However, despite this predictable pharmacokinetic profile, aminoglycosides always retain their potential for serious toxicity. Moreover, aminoglycoside toxicity can occur despite the maintenance of serum levels in the therapeutic range. 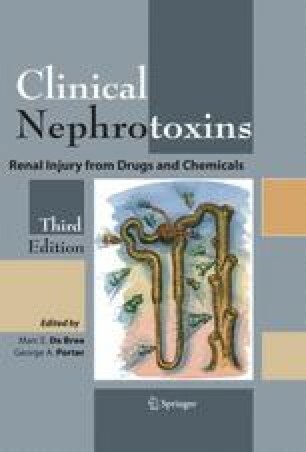 The purpose of this section is to describe the nephrotoxicity associated with the clinical use of aminoglycoside antibiotics.